Nils Pickert’s 5-year-old son likes wearing dresses. If anyone thinks that’s odd, they can take it up with Nils. He’s the guy in the skirt. 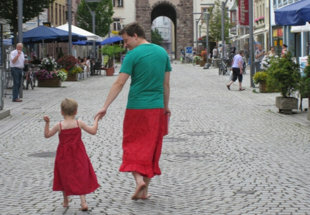 The German dad has become a role model not only for his son, but for parents around the world, after a photograph of the pair holding hands in red skirts spread across the internet. “Yes, I’m one of those dads, that tries to raise their children equal,” he explained in an essay published alongside the photo in Emma, a German feminist magazine. Pickert never minded that his son liked dressing in little girl’s clothes, but when his family moved from West Berlin to a small southern town in Germany, he learned that other people did. In fact, it became a “town wide issue,” according to Pickert, whose essay was translated by Tumblr user steegeschnoeber.